Mark Booth and Claire Ashley’s exhibition “AIR: tasteless, odorless, colorless” at the destination SideCar Gallery finds the two artists, who are also friends, in close conversation. The exhibition plays back and forth between the ethereal and the corporeal, the lightweight and the clunky. Installation view of "AIR" at SideCar. Image courtesy of SideCar. Mark Booth exhibits the textual drawing and wall installations that typically characterize his practice. Here his vinyl wall text drawings scroll up and down the walls inside the vintage home. In one work, the blocky orange text ends with the phrase “linked logically by their mutual admiration of song” where the word “song” separates from the plane of the text by following an undulation in the wall caused by a hidden chimney creating an airiness to the word “song” as if it intends to fly away. His texts contain constant references to the end or beginning or interruption of ecstasy by bodily reality, not as some outmoded Platonic duality between body and mind, but rather as a fresh interrogation of what it means to be human. These words are accompanied by an ink drawing of those spools and the ceiling reference could be the ceilings of the house. Elsewhere, different snippets of text jump out and shift perceptions of the show like a “visible penile outline in a racing uniform.” That seemingly describes Claire Ashley’s taut inflated forms. 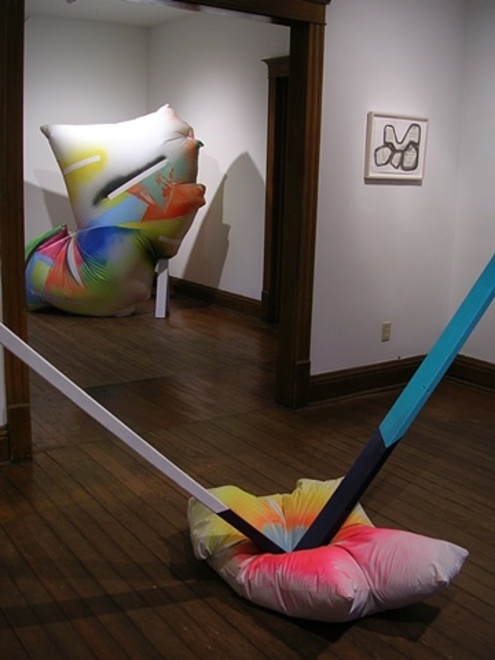 If Mr. Booth’s works reach to the bodily from the ethereal, Claire Ashley’s inflatable sculptures do the opposite. Historically, the language of soft sculpture has been set. By creating slouching, bulging or stretching sacks the works call forth all kinds of bodily and animalian associations. With Ms. Ashley’s inflatables breath is more evident. The enlarged white canvas tarpaulin bodies are sprayed with vibrant gradations of color, both revealing and obscuring their form. The fluorescent color further lightens the forms weight giving them the character of a bright refraction of light, a kind of buoyancy set against their otherwise slouchy appearance. In fact the first work encountered in the show Prussian V (Whoopee) is pinned to the floor with a dramatically angled two-by-four. Outside the house, fluorescent painted trash bag-like pieces leak out of the attic windows like bloated decaying clown flesh. Visible from the street or the alley they are alternately haunting and completely non-threatening. 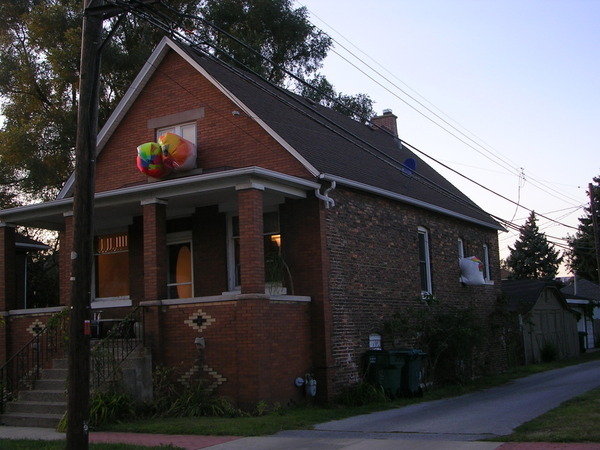 Calling attention to the house creates another tension between the possible repression of “things in the attic” and the connotations of a circus or amusement park. This is Side Car Gallery’s contribution to the exhibition. Its site in Hammond is not even close to a neutral gallery space because of the vintage home and the location outside of the urban core of Chicago—but that is also its possibility. The quality of the aesthetic conversation between Ms. Ashley, Mr. Booth and Side Car makes it worth the travel time. I am sorry that you stopped short of really making a statement. I would have liked to see these plastic bags embellishing this house in the place of flowers in the garden or relaxing on the porch. I would have preferred to say OMG rather than WT_. Better luck next time.